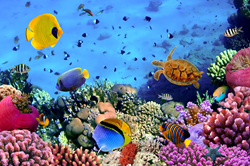 Sansone Companies announces 25,000 square feet Sea Quest Aquarium will open in the third quarter of 2016. “We are excited to be partnering with Sea Quest,” said Roland Sansone, president of Sansone Companies. Sansone Companies, the new owner of the Boulevard Mall, announces Sea Quest Aquarium to open in the third quarter of 2016. This 25,000 square feet interactive aquarium experience will be Sea Quest’s third location in the United States and the largest of the three properties. The entrance will be found between Macy’s and Goodwill, where guests will be welcomed with large aquariums filled with bright colored fish and seahorses. Sea Quest Aquarium can also be found in two Texas cities, Austin and San Antonio. The aquarium sets itself apart by offering amenities such as live interaction and feeding with the animals, snorkeling with stingrays and sleeping with sharks. With the aquarium’s goal to teach responsibility in conserving the animal world, having the opportunity to feed the animals forms a bond and understanding. Food packages can be purchased at the aquarium or patrons save up to $11 for purchasing the packages online. Snorkeling with stingrays is an interactive experience that gets you in three to five feet deep water with various species of stingrays and tropical fish. Guests will be given a snorkeling class before the session, and groups may have up to three people per swim. The open public sleepovers with sharks provide adult chaperoned groups the opportunity to experience the aquarium in a new way. Groups can receive a nocturnal animal tour that includes night-time shark feeding and octopus viewing, morning bird feeding and a movie night. “We are excited to be partnering with Sea Quest,” said Roland Sansone, president of Sansone Companies. “The aquarium will be able to give families a place to create lasting memories while experiencing something different in Las Vegas.” Since the acquisition of the mall by Sansone companies, the real-estate development company has worked tirelessly at returning the mall to its former glory. New vendors include John’s Incredible Pizza and Goodwill. Since John’s Incredible Pizza opened its doors in 2016, lines have been out the door with families eager to check out the hundreds of games, rides, and attractions. Goodwill has also been getting noticed as this is the nonprofit’s largest store in history, as well as the first Goodwill to be opened as an anchor spot in a major mall. Founded by Roland Sansone, Sansone Companies has developed real estate in the Las Vegas area for the past 35 years. The property offers full-service property, facilities, leasing, and sales consulting and management in both commercial and residential real estate. The company owns and manages several successful retail, medical, and office centers in Las Vegas including Park Place, Sansone Richmar Plaza, and the Boulevard Mall.